will be shipping again on Wednesday, May 15, 2019. 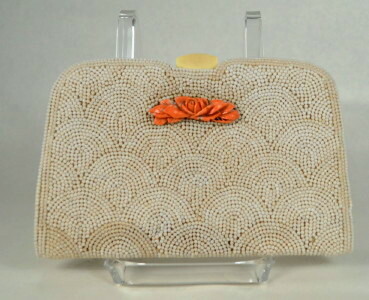 1920's vintage flapper evening envelope clutch handbag. Ivory beads, sea coral trim, beige leather gusset and ivory silk moiré . Solid applied beads in scallop pattern with banding at edge. Applied hand carved sea coral rosette. Cream celluloid bar snap clasp. Leather gusset and frame covering. Ivory silk moiré lining. Frame opening - 3" X 5 3/4"
Very good condition. Shows wear to bead surface, also some color variation. Lining shows light wear and age discoloration.